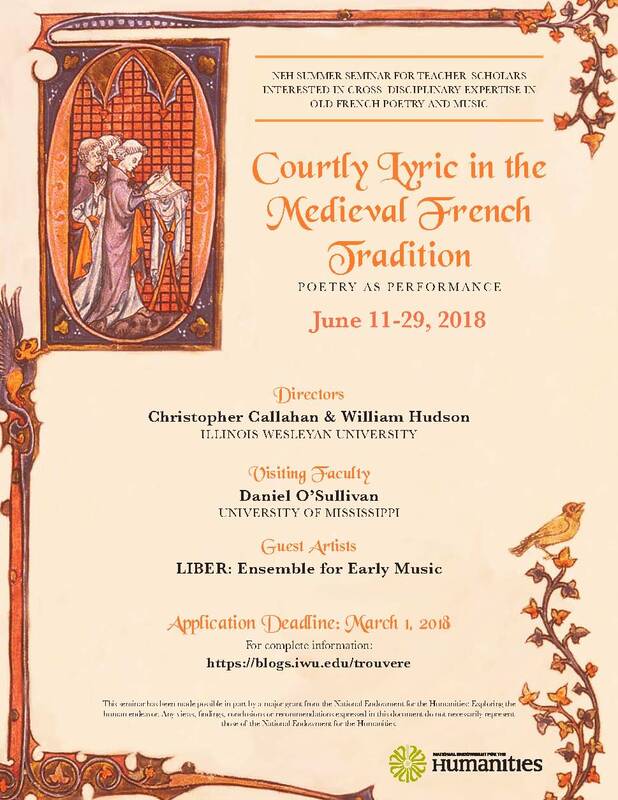 A gentle reminder that deadline for our NEH Summer Seminar on the trouvères is quickly approaching, and that there are still places open. When I first announced this in December, we didn’t have the very-attractive flyer you’ll find here, nor was our website fully developed; two reasons to further consider and pursue this opportunity. The last lyric seminar combining language, poetics, paleography and music was offered – to the best of my knowledge – in 1987. 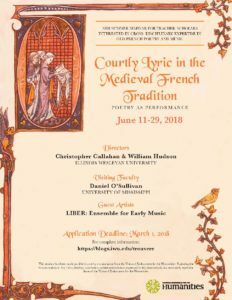 That the NEH is eager to fund a medieval topic like this is both exceptional and a mark of the quality of what we are offering. The Sixth Annual Symposium on Medieval and Renaissance Studies (June 18-20, 2018) is a convenient summer venue for scholars from around the world to present papers, organize sessions, participate in roundtables, and engage in interdisciplinary discussion. The goal of the Symposium is to promote serious scholarly investigation into all topics and in all disciplines of medieval and early modern studies. The plenary speakers for this year will be Geoffrey Parker of The Ohio State University, and Carole Hillenbrand of the University of St Andrews. The Symposium is held annually on the beautiful midtown campus of Saint Louis University. On-campus housing options include affordable, air-conditioned apartments as well as a luxurious boutique hotel. Inexpensive meal plans are available, and there is also a wealth of restaurants, bars, and cultural venues within easy walking distance of campus. The Sixth Annual Symposium on Medieval and Renaissance Studies invites proposals for papers, complete sessions, and roundtables. Any topics regarding the scholarly investigation of the medieval and early modern world are welcome. Papers are normally twenty minutes each and sessions are scheduled for ninety minutes. Scholarly organizations are especially encouraged to sponsor proposals for complete sessions.